NETWORK FINALS: As anticipated, NEW AMSTERDAM lost 0.1 in final numbers. CABLE HIGHLIGHTS: ESPN’s coverage of the MLB WILD CARD GAME dominated Tuesday cable at 2.09. On USA, WWE SMACKDOWN slipped 0.03 to 0.69, and THE PURGE was down 0.09 to 0.35. On FX, the newly-renewed MAYANS MC stabilized after last week’s big drop, down 0.04 to 0.55, and MR. INBETWEEN was at 0.22/0.16, compared to last week’s 0.23/0.17. Bravo’s BELOW DECK returned at 0.46. Fox News’s HANNITY led cable news at 0.44/0.73/4M, with MSNBC’s RACHEL MADDOW SHOW at 0.42/0.62/3.3M, and CNN’s CUOMO PRIME TIME at 0.29/0.39/1.3M. TNT’s NBA PRESEASON games were at 0.42/0.31. MTV’s THE CHALLENGE lost 0.04 to 0.41. 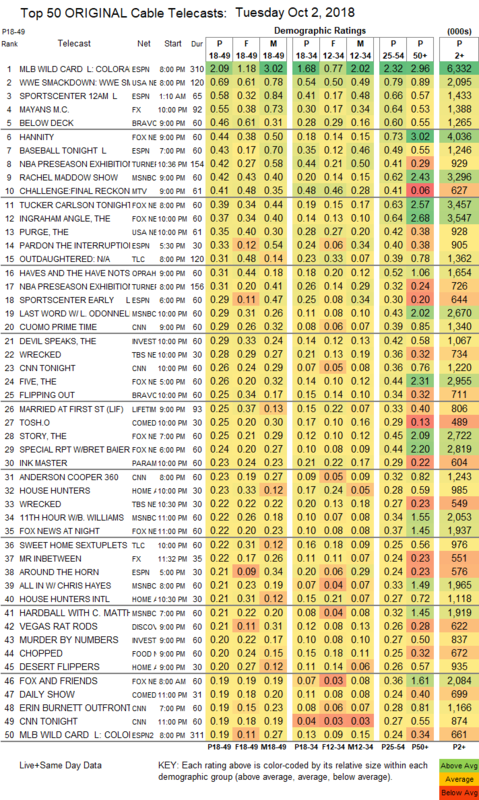 On TLC, OUTDAUGHTERED shed 0.02 to 0.31, and SWEET HOME SEXTUPLETS was down 0.08 to 0.22. OWN’s THE HAVES AND HAVE NOTS returned at 0.31, and BLACK LOVE was at 0.14. On ID, THE DEVIL SPEAKS dropped 0.03 to 0.29, and MURDER BY NUMBERS was down 0.03 to 0.20. 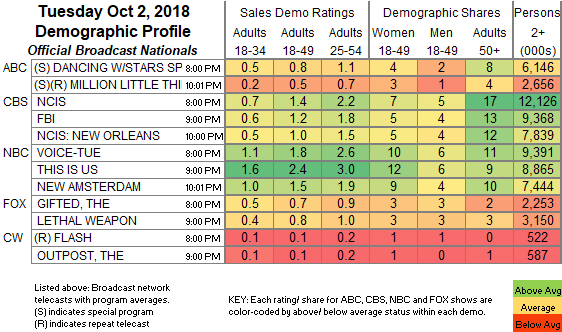 TBS’s WRECKED was at 0.28/0.22, compared to last week’s 0.32. On Comedy Central, TOSH.0 fell a tenth to 0.25, and THE JIM JEFFERIES SHOW was down 0.03 to 0.14. Paramount’s INK MASTER dipped 0.04 to 0.32. On HGTV, HOUSE HUNTERS ticked up to 0.23, HOUSE HUNTERS INTL was also up a tick to 0.21, and DESERT FLIPPERS was down 0.05 to 0.20. Discovery’s VEGAS RAT RODS was at 0.21, and lead-out TRANS AM was at 0.16. Food Network’s CHOPPED fell 0.08 to 0.20. WGN’s CARTER was steady at 0.02/163K.